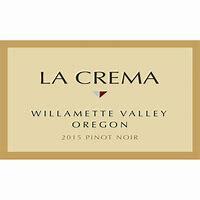 An excellent Pinot Noir from Willamette Valley in Oregon comes from La Crema Winery. La Crema was founded in 1979 in Sonoma County, California by Jackson Family Wines. They are the same family which is more familiarly known for their Kendall Jackson Wines. In 2013, Jackson Wines bought 392 acres of land in Oregon’s Willamette Valley. Willamette Valley has a beautiful, cool climate that allows them to grow their own rich, flavorful grapes to create a perfect Pinot Noir. Craig McAllister, a native from New Zealand first joined La Crema in 2007 as harvest Enologist and was named head winemaker in 2017. He has a strong passion for the outdoors and over 20 years of experience within the wine industry which helps make him a great fit with the La Crema team. He oversees the grapes from vine to bottle adding in his own knowledge and expertise in what he believes makes a great wine. La Crema Willamette Pinot Noir is made from 100% Pinot Noir grapes. All grapes are hand-picked and then cold soaked for three to five days. This allows the clear juices inside the fruit to take on a rich burgundy color from the dark purple skins. After the juices have been gently pressed out, the liquid spends nine months in new and reused French Oak Barrels. On the nose you can pick up violets, berries, and bay leaf. When drank the palate enjoys notes of raspberry, dark spices, coffee bean, and zest of orange. This wine is light in tannins with touch of cedar. La Crema Willamette Pinot Noir has an ABV of 14.5%. La Crema Willamette Pinot Noir is a great wine to enjoy while socializing with good friends out on the patio. I also enjoy La Crema Willamette Pinot Noir served with traditional Prime Rib. The subtle tones of Pinot Noir pairs perfectly with a garlic and rosemary crusted Prime Rib. Place a flat roasting rack inside a roasting pan large enough to fit your roast and spread the onions on top of the rack. It’s ok if you don’t have a roasting rack–resting the roast directly on the onions works also. Place the roast in the pan. Take the roast out of the refrigerator 2 hours before cooking time to allow the roast to come up to room temperature. Preheat the oven to 450 degrees F and place your roast on a lower oven rack. Placing the oven rack too high up will cause your roast to brown too quickly and burn! Once the prime rib roast is browned on the outside (1-hour total should do it, but times may vary depending on your oven), lower the heat to 350 degrees F. Continue roasting the prime rib for another 90 to 120 minutes. Baste the roast every 30 minutes and add hot water ½ cup at a time to ensure the roasting pan does not dry up. A general rule I use to approximate roasting time is a total of 15 minutes per pound, so for this 12-pound roast, the total roasting time should be 180 minutes. With temperature changes, that means roasting at 450 degrees F for 60 minutes followed by 120 minutes at 350 degrees F. That said, these times are approximate–using a meat thermometer is a must. You don’t want to overcook it! 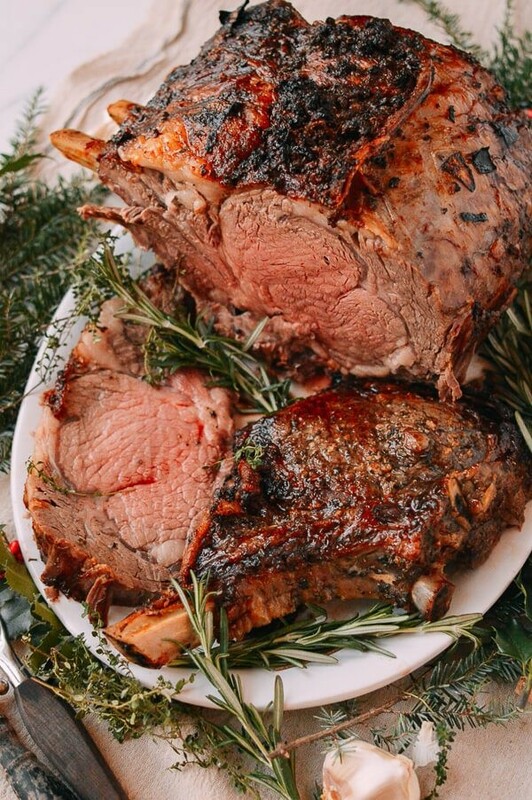 We always cook for medium rare, so the time will be closer to 90 minutes, or when the prime rib roast reaches an internal temperature of 125 degrees F. This gives you two more well-done Prime Rib end cuts and a couple of medium pieces mixed in with the medium rare cuts. If you like it rare, then roast for less time, taking the roast out of the oven when the internal temperature reaches 120 degrees F. Just remember that the meat thermometer is your guide and that the roast will continue to cook a bit while it rests on the kitchen counter! While the prime rib is resting, pour the pan juices through a fine mesh strainer into a fat separator. If there is not enough liquid, add a ½ cup of water to the hot pan, and stir lightly. Pour the juices from the fat separator into a small pot or sauté pan and set aside. Warm up the au jus and serve alongside the prime rib. You can further dilute it with some hot water to taste if it’s too salty. If it suits your fancy, you can also serve some horseradish alongside.